I realized I wouldn't be able to see War Horse when I could barely watch the trailer without choking up. 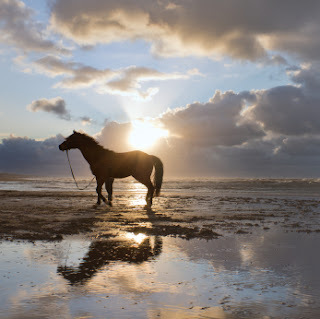 While I know that no horses were harmed during the actual shooting of the film, I also know that millions of horses who heroically risked their lives in wartime service to their countries, lost them. Steven Spielberg has got me thinking about them, not just the horse of the story, who somehow made it back home alive. It's with that in mind that I'm offering a special rate ($60) for consultations with horses in spirit this month, through the end of January. As I start my sixth year as a professional animal communicator, I am increasingly awed by the richness of the stories shared by animals with whom I've connected, and especially by those who have left their bodies for life in a new dimension that we don't fully understand. In virtually every case, the now-departed animals have provided verifiable information derived from their daily experiences with their human companions, and have brought a drop of comfort to the people who desperately miss them on this side of the veil. If you're interested in a session for your horse in spirit, you can request a session at the Animal Translations website. If you want to pay by PayPal, just use the $60 followup rate.